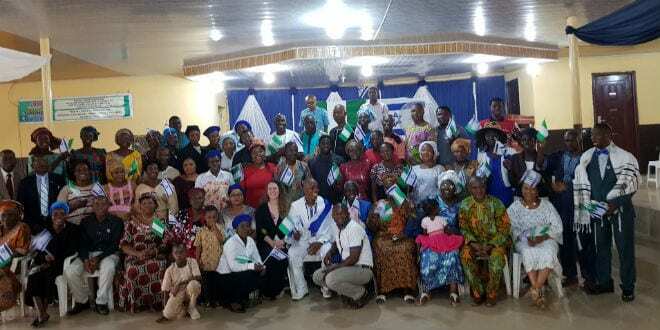 The Light From Zion Shines Over Nigeria - Breaking Israel News | Latest News. Biblical Perspective. Norwegian resident Britt Lode is the editor of The Light From Zion, a book about the weekly Torah portion, written by Orthodox rabbis especially for pro-Israel Christians. At the invitation of Pastor Rex Ajenifuja, the director of I Stand With Israel, Lode recently visited Nigeria to meet with and strengthen Christian Zionists there. Though many people think of Nigeria as a Muslim country, Ajenifuja told Breaking Israel News that, “Nigeria has been misrepresented in the world. We have more Christians than Muslims, but because of our leaders, who are mostly Muslim, they manipulate the statistics. Nigeria has the highest number of churches in the world and Nigeria has the highest number of pastors in the world. The Bible Society of Nigeria ranks second in the world, next the the Bible Society of America. By all standards, Nigeria is a Christian nation. Lode confirmed Ajenifuja’s claim. She told Breaking Israel News, “I was so amazed because they really love Israel with all their hearts. And they are not scared of showing it. They have Israeli flags in their houses, cars, offices and churches. They really want to be a part of it. In every social layer, the High Court of Justice, very well-known pastors, State government representative, they all love Israel. During the 11 days she spent in Nigeria, Lode estimates that she spoke to thousands of people. One of the stops was at a travel agency that sends 600 Nigerians to Israel each year. Part of Lode’s homework is to help connect them to Bible-based tour guides in Israel. She met with over 50 groups and her overwhelming impression was that, “They are Christians who want to learn more. They really understand that the Jewish people have been protecting the wisdom and the secrets of the Torah all the way back to Moses. They agree that this book contains the wisdom and secrets that you need to know as a Christian, to grow in your faith and to connect with Israel and the Jewish people.” During her visit, 200 copies of The Light from Zion were printed locally and distributed in Nigeria. Ajenifuja shared, “I invited Britt to Nigeria because of her passion, of her focus, of her energy to connect the Jewish nation with the Christian nation. Indeed, I did learn so much from her while she was here. She was seen as an ambassador of Jewish-Christian relationships. I invited her so we can learn how we can be connected with our Jewish brothers and sisters – how can we really understand our Jewish connection. Her trip here was extremely successful because we covered so much. We went to five different states of Nigeria. All places she went she was welcomed. The opportunities for deeper connections between Israel and Nigeria are also plentiful. Lode noted, “There are millions of Christians in Nigeria, so it’s a huge need for people who can connect them to Israel. They will need a lot of rabbis! The rabbis need to wake up very quickly. “I went there only because of Rex. I saw the spirit that was in him. I saw his faith and his love for Israel and I thought, when God raised up men like, that God is doing something in Nigeria. Only by that, I trusted God that he wanted me to go there. Only because I saw what was in Rex. “And when I came to Nigeria I saw it’s not only Rex who has so much love for Israel, who is so connected to the Bible. For me, it was like God revealed Nigeria. My friends and my family thought I was crazy and were scared I was not coming back alive. I did it only because I had a strong faith that God wanted me to go there. Originally, I had no desire to go to Nigeria. “I want people to know that they have a huge prayer army for Israel in Nigeria. There is huge love for the Jewish people. There is huge support. They are standing up for Israel and the Jewish people. I believe they will have a special part in the End Times. “I am a woman from Norway going to Nigeria, promoting Israel. That can only come from God. That is beyond logic. When a Norwegian lady from a Christian background is promoting the Orthodox rabbis from Israel in Nigeria, only God can do that,” Lode concluded.